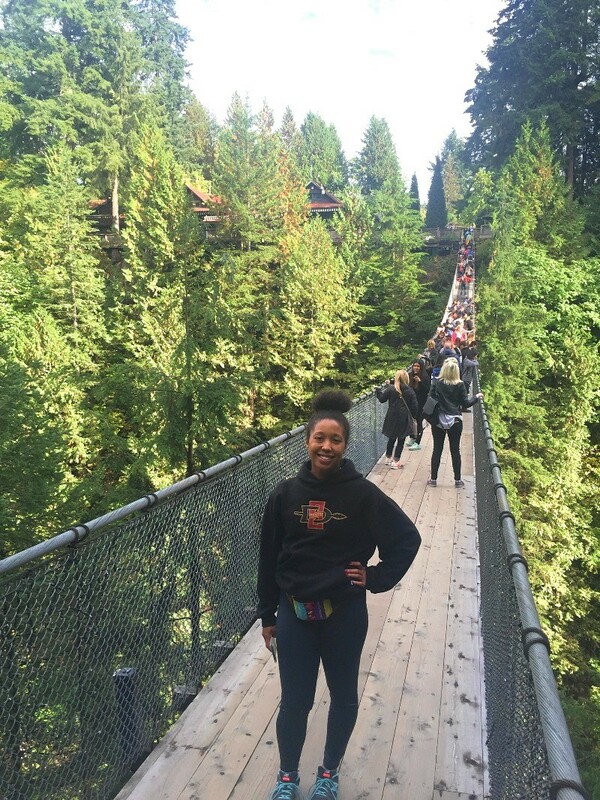 We loved exploring the Capilano Suspension Bridge Park in Vancouver, BC, Canada. 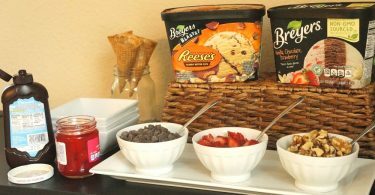 It was definitely one of the highlights of our trip! Vancouver is a great fall travel destination to put on your bucket list. 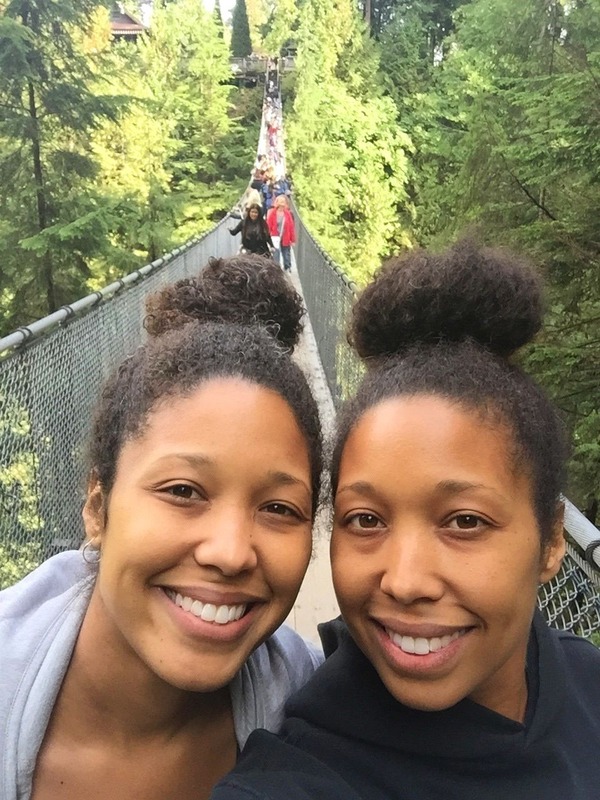 I visited Vancouver in the fall with my sister and it is truly a beautiful destination. The temperature is in the 60’s, cool but not cold, there are lots of outdoor activities to enjoy, and the season changes are simply stunning to witness! We don’t have visible season changes here in Southern California, so this was such a wonderful sight. 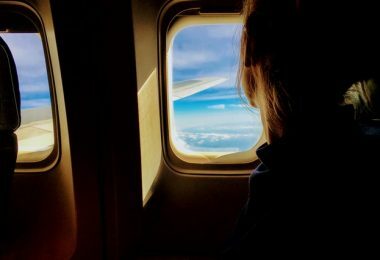 There are so many things to do in Vancouver, tourists can take a waterfront walk along the river at Stanley Park, take a ferry to the neighboring Granville Island, enjoy the art and theater scene, and take a trip to the mountains for outdoor adventures. One of the top attractions in Vancouver, BC is, without a doubt, the Capilano Suspension Bridge Park! The infamous Vancouver Capilano Bridge is located on a 27 acre park in the North Vancouver area. 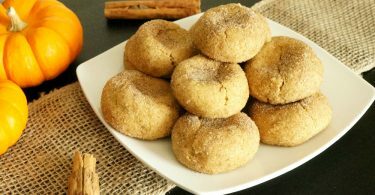 It is an attraction built around the natural forest and is perfect for people of all ages to explore. You can take a guided tour and learn some of the history and facts about the park, or spend the day making your own adventures through the park like we did. I highly recommend you make plans to take the whole family to the Capliano Suspension Bridge Park the next time you’re in Vancouver! 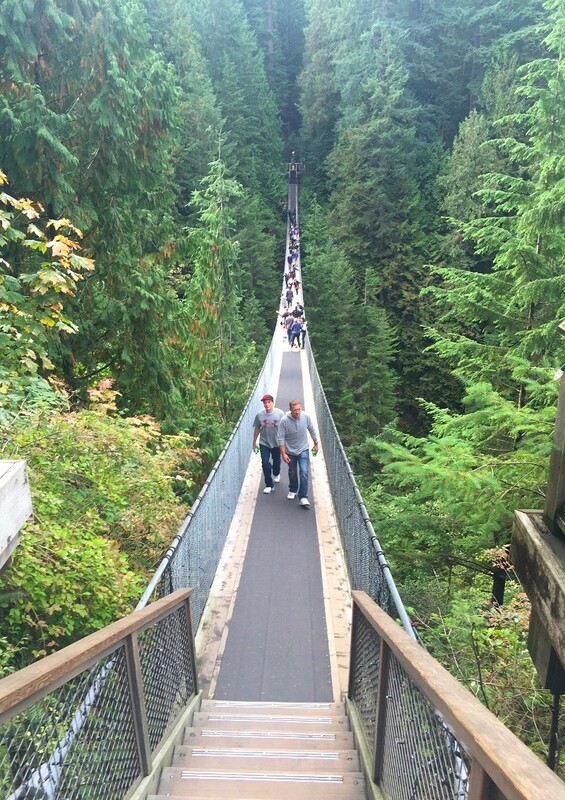 The Capliano Suspension Bridge Park in Vancouver, BC is much more than just the bridge. 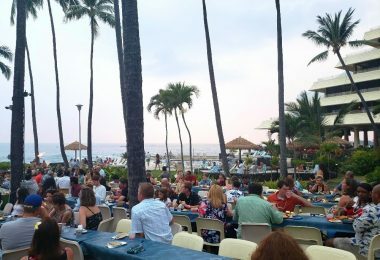 There are lots of activities to enjoy, and we tried almost all of them! This bridge was built in the late 1800’s, stretching 450 across the Capilano River atop the vast rain forest full of evergreen trees in North Vancouver. 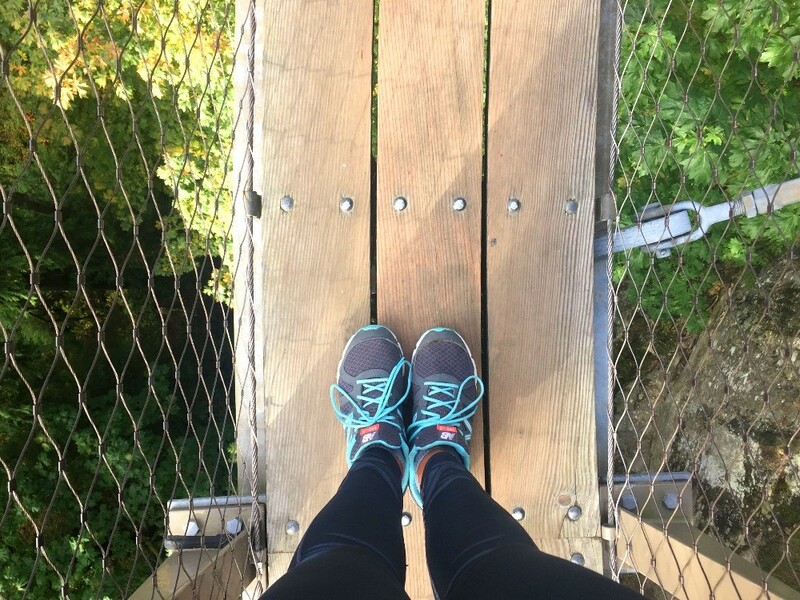 I was a little shaky at first at the thought of walking across a swaying bridge, but once I stepped on, it was really exhilarating! Being sky high above the trees and a rushing river is definitely a must-do, there is something so peaceful about hearing only the sounds of the birds and faintly, the river below. Seeing the natural sights from both sides of the suspension bridge at over 100 feet high was just fabulous! 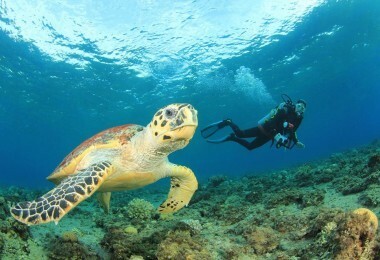 This is a thrill seekers dream! An open walkway is suspended above the forest into the rocks and cliffs where people can take a look at the world from high up! This very high and narrow walkway has a glass floor on some parts, and it is so neat. This walkway takes you into different areas of the 27-acre park that aren’t explorable on the ground, the rushing Capilano River runs below. The view from up there is unbeatable! This is a fun way to hop around through the trees without actually having to climb them! 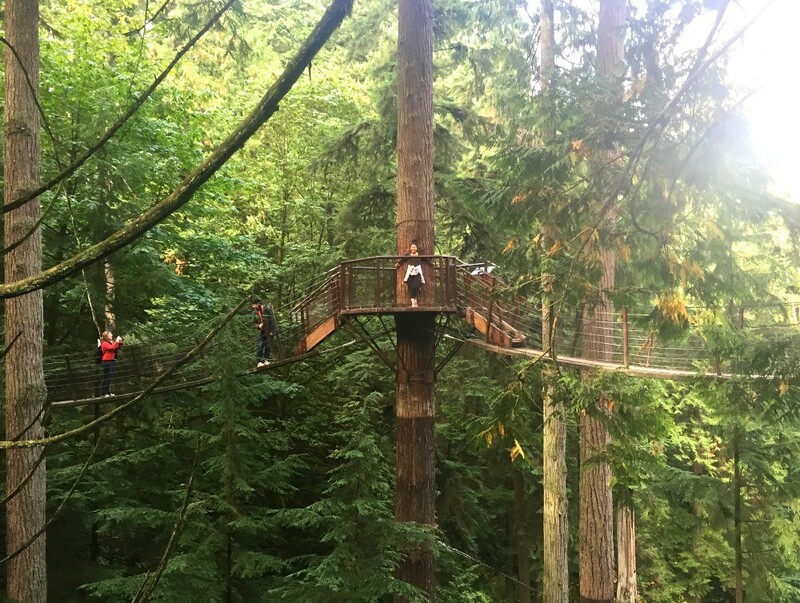 The treetops adventure is a series of cable walkways that cascade through the forest’s trees. They go from platform to platform, which are built around these 250 year old Douglas Firs, they can adjust them as the trees grow. This is such a fun canopy walk, we loved going across from tree to tree! 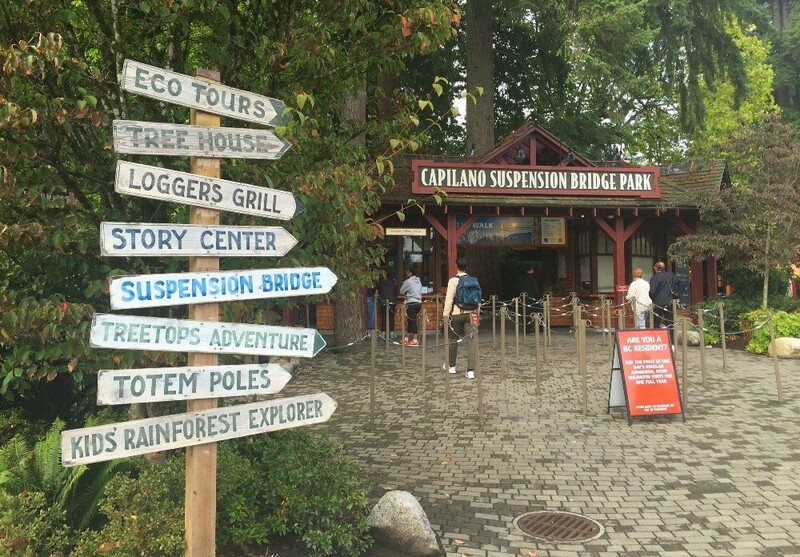 These two places inside the Capilano Suspension Bridge Park in Vancouver share a little bit of info about the location and it’s history. The Story Centre is filled with artifacts and antiques sharing the bridges history and early days of the “tramps” who used to trek to this bridge. 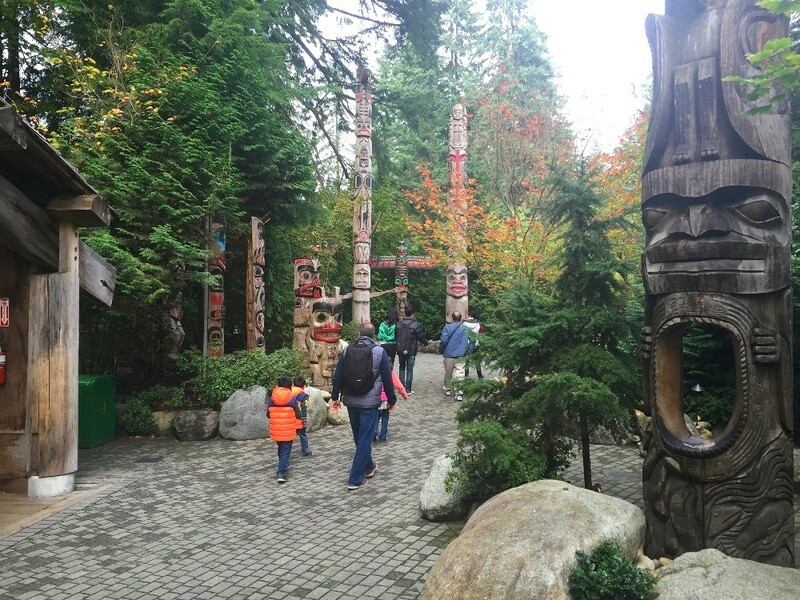 Kia’Palano is the name of the First Nations people in BC, and you can learn all about their tradition of placing totem poles into the ground. This is an educational adventure within the park, which teaches about the stories told on each totem pole, a Kia’Palano tradition. 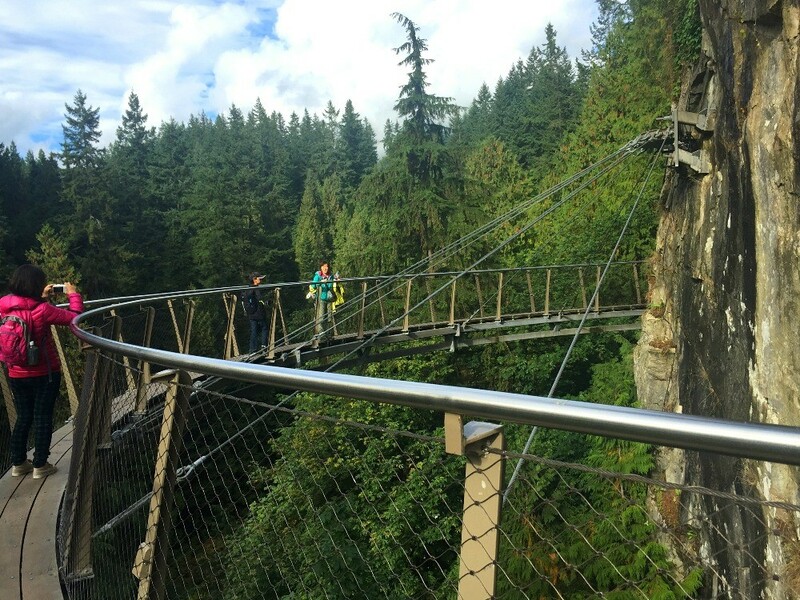 We really enjoyed this adventure on the Vancouver Capilano bridge, which seems to be a new way to explore the natural world in the forest without treading too tough on it! I wish I could have brought my kids, this is a place that I will definitely take them one day. There is a fun, self guided and interactive Capilano Kids Rainforest Explorers Program, my kids would absolutely LOVE this! Make plans to spend the day at Capilano Suspension Bridge Park in Vancouver, BC, it’s such an awesome place to explore the outdoors and walk super high up in the tall trees!